Summer season is a great time to spend a wonderful escapade with the family and friends in some of the best Branson water parks. In Branson, you can have a total vacation experience in a great place where Branson water parks abound which include Grand Country Resort, Castle Rock Resort & Water Park, and White Water Park. Located in the heart of Branson, Grand Country Resort is the grandest family destination which offers all day water park fun at Splash Country Indoors and Outdoors, Fun Spot Arcade and Entertainment Center, 3 themed miniature golf courses, dining experiences, shopping and live shows at the Grand Country Music Hall. At Grand Country Resort, you will get to enjoy great shows, good food, water park fun and relaxing room, all of this can be experienced in a family-friendly resort which makes this place a great family destination. Castle Rock Resort and Water Park in Branson is another great water attraction to spend a summer getaway with the family. 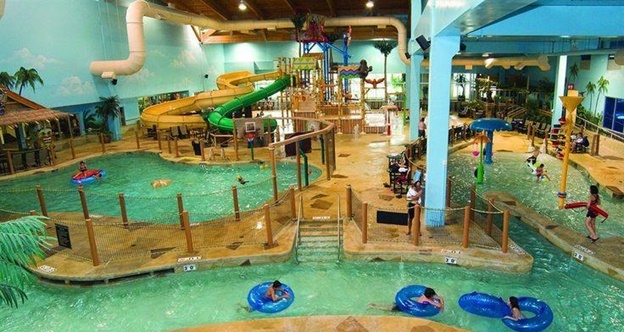 This beautiful resort and water park offers many kinds of thrilling water rides which include Large Thrill Slides (with a height requirement of 42”); Tube Slide (a one person tube slide that drops the rider from then30-foot high tower to the main floor splash pool); Cork Screw Slide (a one person body slide – no tube required); Lazy River (with over 600 feet of endless ride on the mezzanine overlooking all of the fun below); and Activity Pools (which includes 500 gallon tipping bucket, multiple themed kiddie slides, and waterfalls for the little ones to splash around in). The resort also has an Indoor Swimming Pool with a depth of 5 feet, it is great for swimming laps or playing water basketball ; Outdoor Kiddie Splash Pool has a multiple themed kiddie slides, an additional rain tree, and 500 gallon tipping bucket; Outdoor Activity Pool perfect for various activities offered throughout your stay; and a Multi-level Sun Deck which features two covered levels with seating and tables, great for picnic lunch and sunbathing. White Water Park is another great water park in Branson which offers a riveting and relaxing fun rides on a 2 million gallons of water. Every visitor can have the chance to enjoy the tides of the 500,000 gallons wave pool, the gentle flow of the Aloha River or the family-friendly fun at Splashaway Cay and Coconut Grove. At the park, there are rides that are ideal for braver visitors, such as the speed slides of Kalani Towers, a heart-pounding thrill slide ride with a 240-foot plunge followed by a spiraling loop to splashdown. Aloha River at Hula Hula Bay is a highly-themed family attraction that will transport you to the lush Polynesian jungles of the South Pacific. The calm waters will bring you through the wild island landscape with twists and turns, fountains, bubblers, geysers and more. If you want to spend a wonderful getaway this summer season with the family and friends, try some of the best Branson water parks where you can enjoy many thrilling water rides.